Happy Tuesday, April 30th! I’m not going to start out this post by apologizing for not posting lately. That’s getting old. I’m busy and you’re busy blah blah blah. For some reason I loaded my pictures for this post, and they are all backwards, so bare with me. Yesterday I had a small panic attack when I filled in our calendar in our office for May. The picture you see here is not even accurate, as I added several things after I took the picture. School is ending (eeek!!! ), boys are both playing soccer (rec league and travel for 1 of them), the Everything Applique Conference is coming in in like 2 weeks (and today is the last day to register), etc. Anxiety is setting in and I’m not sure how I’m going to survive the month. Did I mention that it’s also my husband’s birthday + Garrison’s birthday + Browder’s birthday + our triplet nieces and nephew’s birthday + our 12 year anniversary, all in May? AAAccckkkkkkk!!! 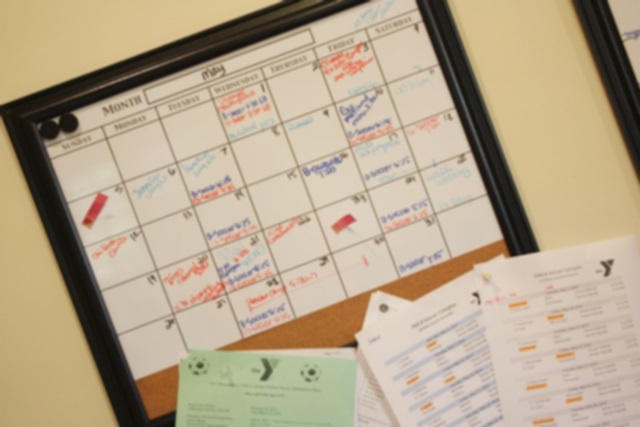 Here are a few things I’ve been up to lately when I haven’t been stressing over the calendar. Sissy had a birthday party to go to this past weekend and they have a pool, so I had in mind to find a cute towel to monogram. I have to say, I was disappointed in the beach towel selections at Target and Walmart. I found this cutie at Kohls! I was also at TJMaxx yesterday and they had some cute ones too. Hopefully Target and Wally World will do better next year. I used Monogram Wizard Plus “Specs” font for her name. 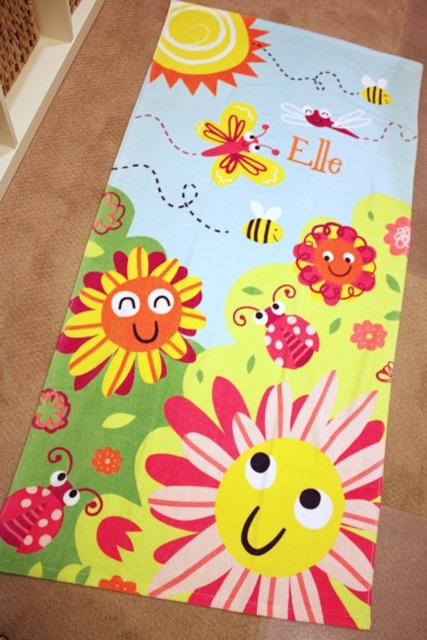 What a bright and cheerful towel! 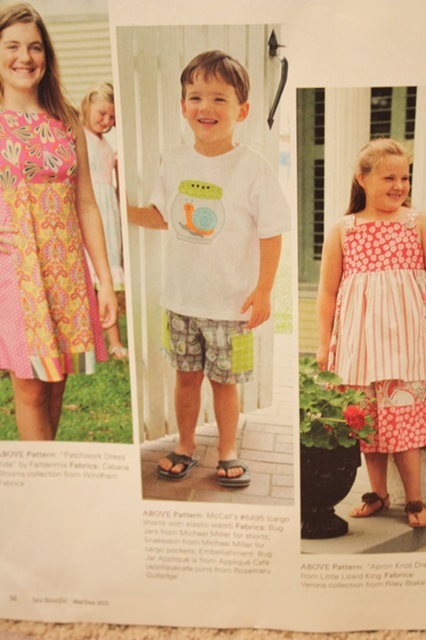 Here’s an Old Navy dress I did recently, and I think you can get these for dirt cheap. 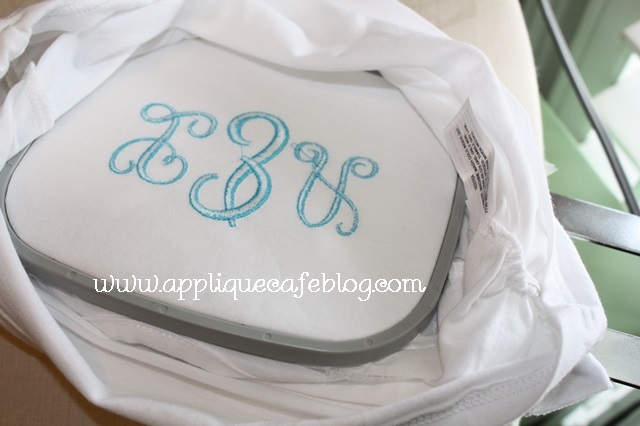 They are perfectly BLANK, so you can easily jazz it up with a monogram or applique design. 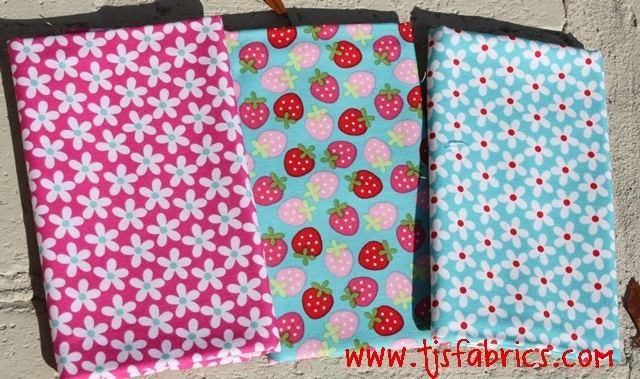 I used our Flip Flop Trio design and some bright fabrics and it turned out cute! I love the blue on the pink, and this pink is brighter and more “highlighted” than it looks. My kids call fluorescent “highlighted”. I think I used MWP “Penpal” for this font. In my last post, I discussed No Show Mesh cutaway stabilizer. I STILL love my medium cutaway, but I did some tees recently and used the no show mesh b/c this particular tee was thin. Some tees are thicker than others so this is a great option for those that are not as thick (where medium cutaway might really show through). Again, my pictures are backwards so this is a shot of the t-shirt after I un-hooped. I used a little spray adhesive to “stick” the no show cutaway to the back of my shirt. This time I ironed some iron on tearaway on the back of that (rather than “floating” it underneath the hoop), so I had 2 layers of stabilizer hooped with the shirt. As you can see here, I hooped all 3 layers (tshirt, no show mesh and tearaway) together. Actually 4 layers b/c I used a layer of solvy on top. So on the back of the t-shirt – 1 layer no show mesh, 1 layer of iron on tearaway and on the top, solvy. 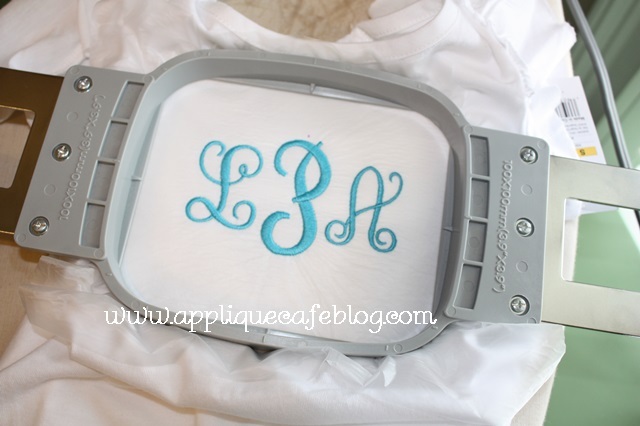 I’ve gotten to where I am using solvy more and more on top of t-shirts, mostly when I am doing monogramming. 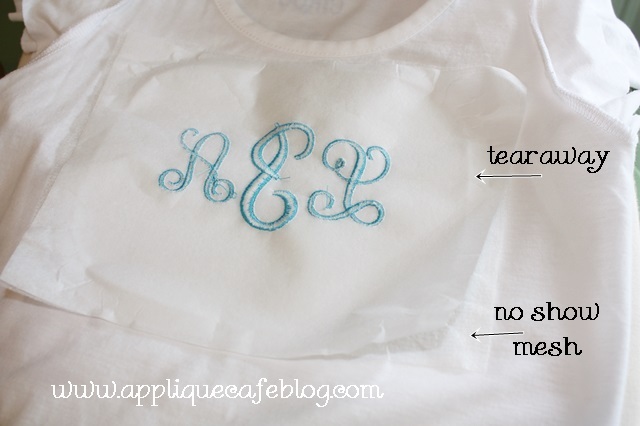 If the shirt is a little thin, then it helps the shirt not to gather in the monogram (like on the ends of the letters). When I’m done, I remove the solvy and tearaway and then trim the no show mesh around the monogram. This is MWP “Pendant” font. 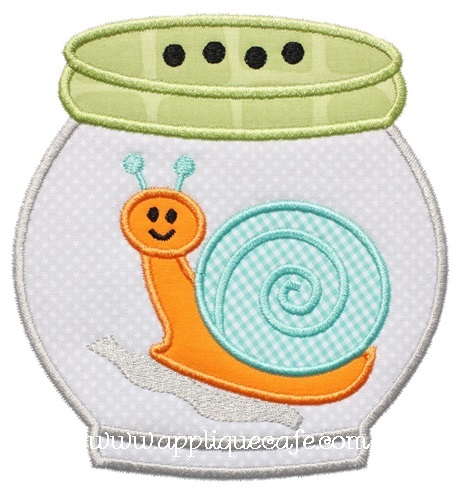 We listed this Bug Jar Applique Design on Monday, which was featured on a t-shirt in Sew Beautiful magazine in their May/June 2013 issue. 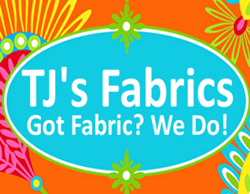 There is a fabulous article on TJ’s Fabrics in the issue, and I was lucky enough to sew a t-shirt with this design on it for one of the cute little models to wear! 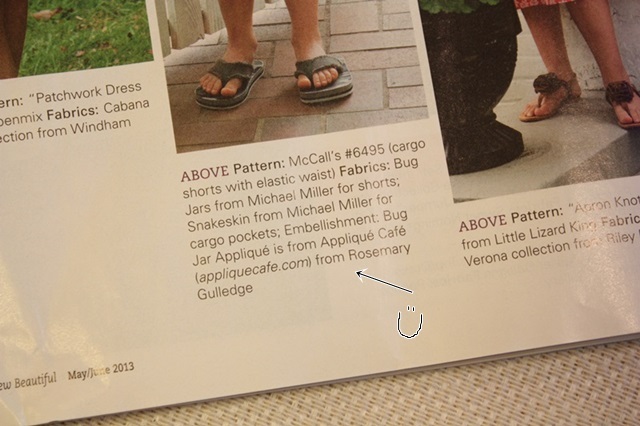 It’s always fun to see your name in print! 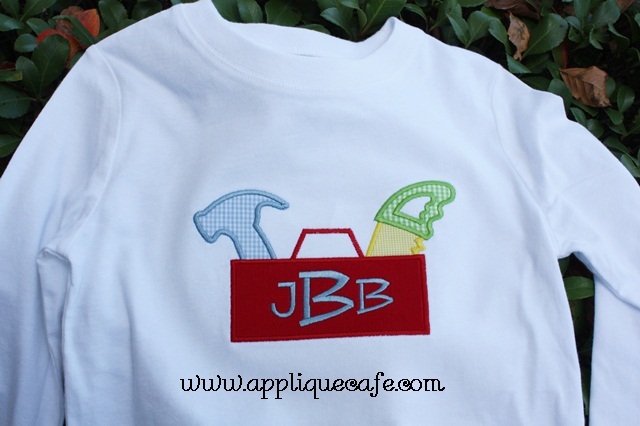 Here is the cute shirt which was made to match the cargo shorts made by TJ’s using their Michael Miller Baby Bug Jar fabrics. 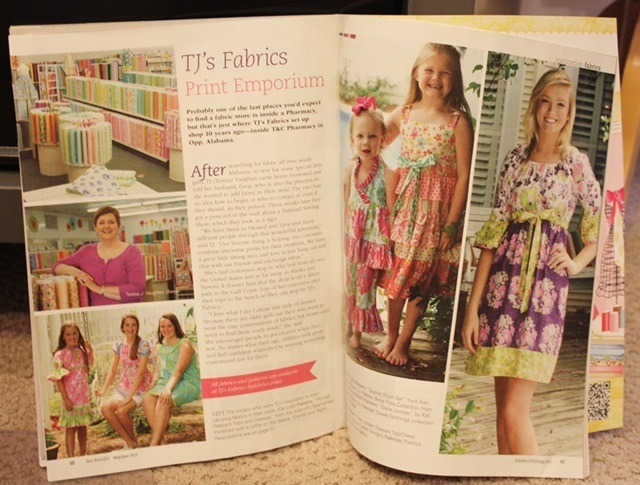 If you subscribe to Sew Beautiful or see it in your local fabric store, pick up a copy! It’s a great article! The outfits they featured are gorgeous!! TJ’s is located in Opp, AL, so don’t forget to plan accordingly if you are traveling to the beach this summer!! We just got back from a Dream Disney little vacation. The boys have been to Disney once, but Mallory had never been. 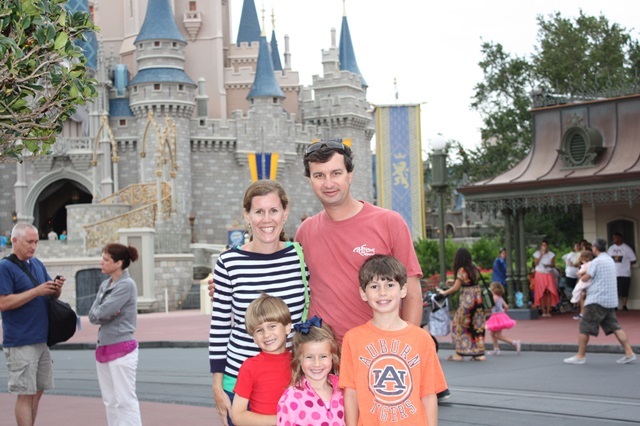 We decided to try a Disney Cruise this year, but hit Magic Kingdom for the day on our way down. 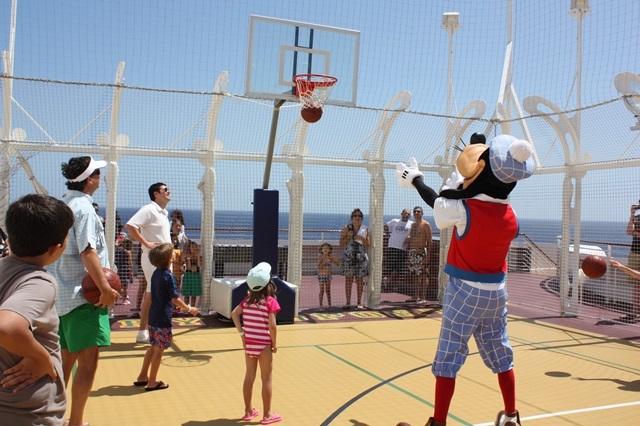 If you are going on a Disney Cruise, let me know. I wrote a book on it (not really) when we got back for some friends who are heading that way in a couple of weeks. It really was MAGICAL!! The cruise was massive and amazing and we will definitely go again! Here are just a few pics ~ I will spare you of the 253 I uploaded from my camera. Here is the “Sail Away” party on the ship the evening we left the Port. Yes, there were like 4,000 people there. I think the recommended pool capacity was exceeded. 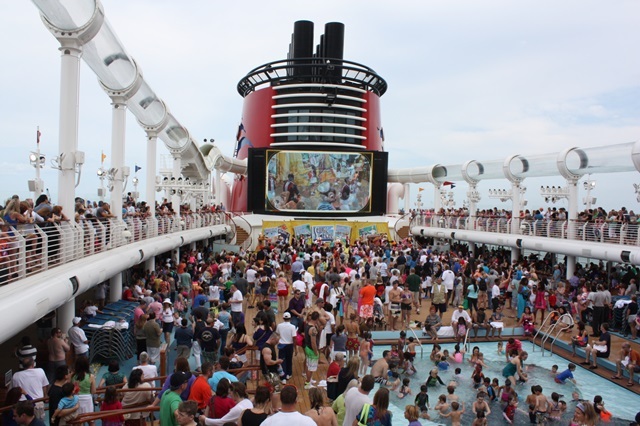 This is the Disney Dream ship which comes and goes from Port Canaveral in Florida. 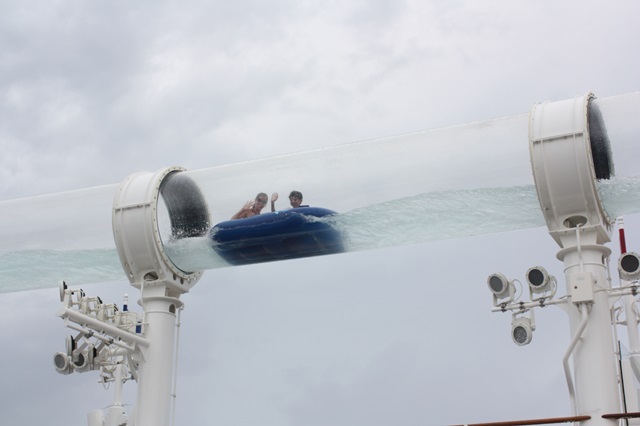 It has an awesome tube slide called the “Aquaduck” that goes literally off the side of the ship, and then around it. Here we are riding the Aquaduck. We rode it many many times (as many as the kids could talk us in to). We met Mickey, Minnie, Goofy and all of the other Disney characters and Princesses (several times). I was fascinated by the characters as much as the kids were! 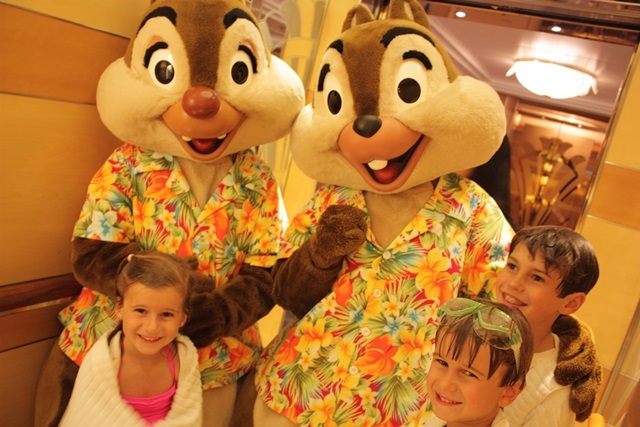 Chip & Dale got on the elevator with us one day. 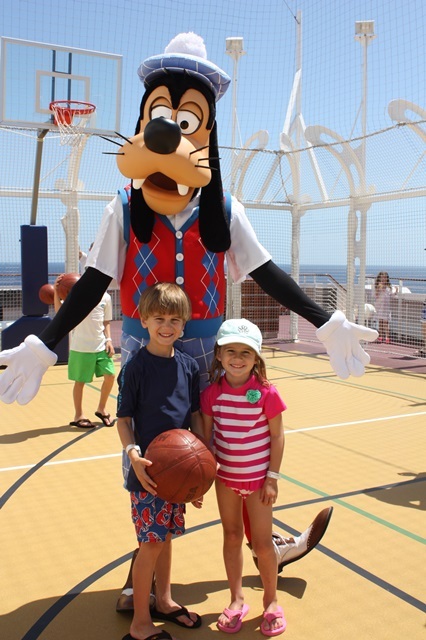 The kids got to play basketball with Goofy! It was so much fun! We HIGHLY recommend it! 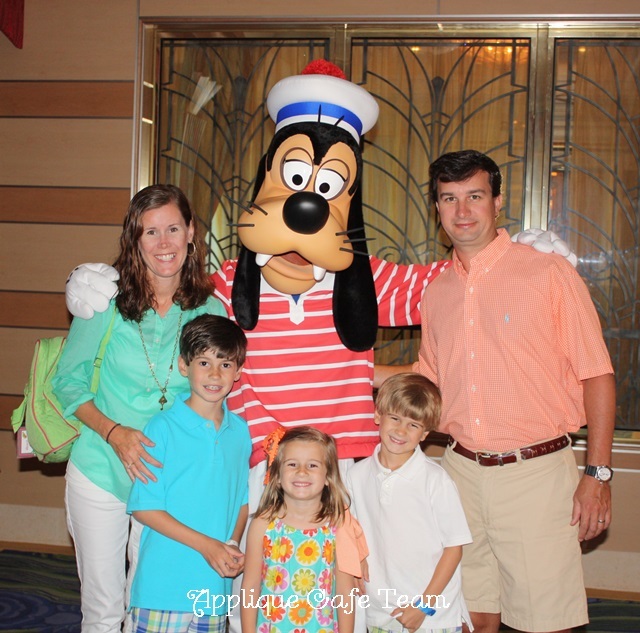 Again, if you are planning a Disney cruise and want to read my tips and suggestions, let me know! 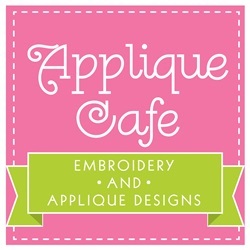 All designs at Applique Cafe are on sale through May 7th, and we are listing 3 more new designs today or tomorrow! Have a great week! 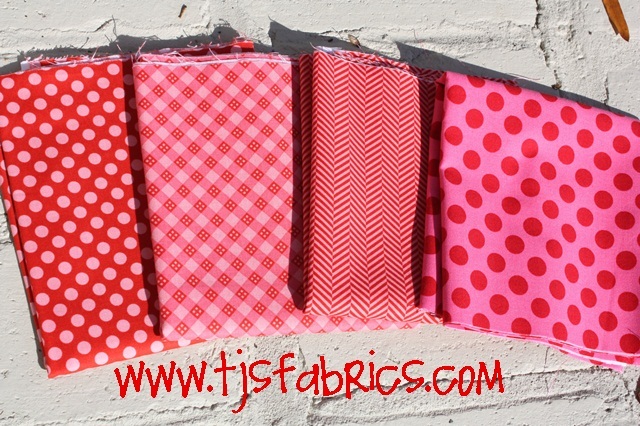 Congrats to our Fabric Giveaway winners ~ Sally T., Teela F. & Penny W.! 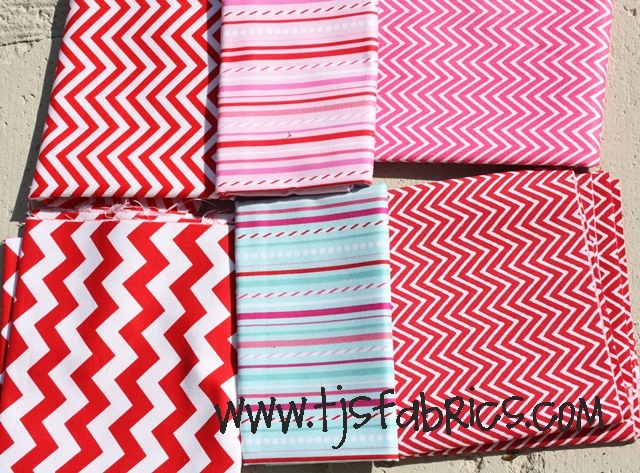 I mailed your fabric today so you should get it by the weekend! Since the comment response was so fabulous, we also drew a few Applique Cafe winners ($10 voucher code) ~ Judy P., Sarah and Anna! The fabric winners also received a voucher code. 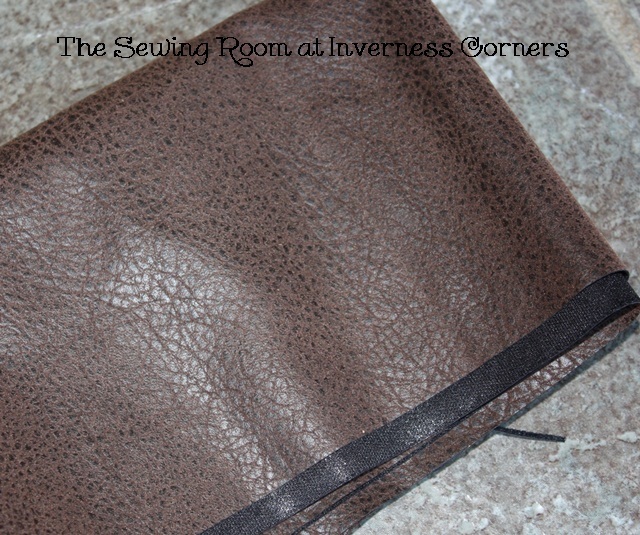 Thanks to all of you who took the time to read my blog, Like The Sewing Room on Facebook and comment! Michael Miller and Riley Blake should have NO WORRIES. Recession or not, these guys are sellin’ some fabric! Moda, Robert Kaufman and a few others aren’t eatin’ Ramen noodles either! 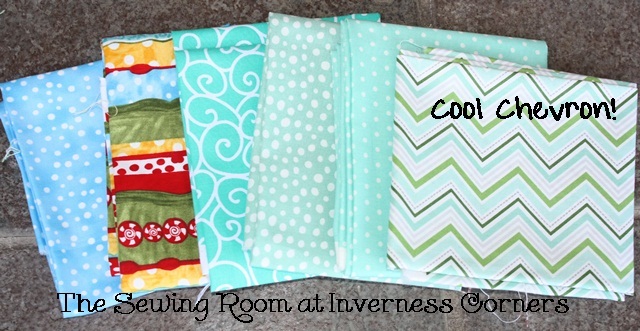 Here are a few more great fabrics from The Sewing Room. 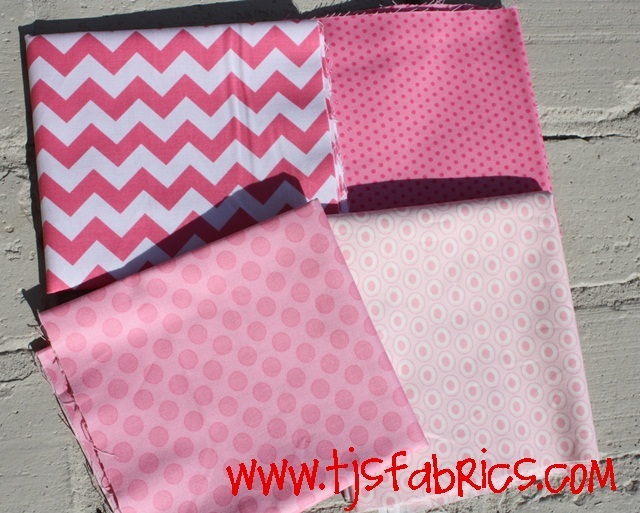 LOVE the tone-on-tone pink Chevron (Riley Blake)! 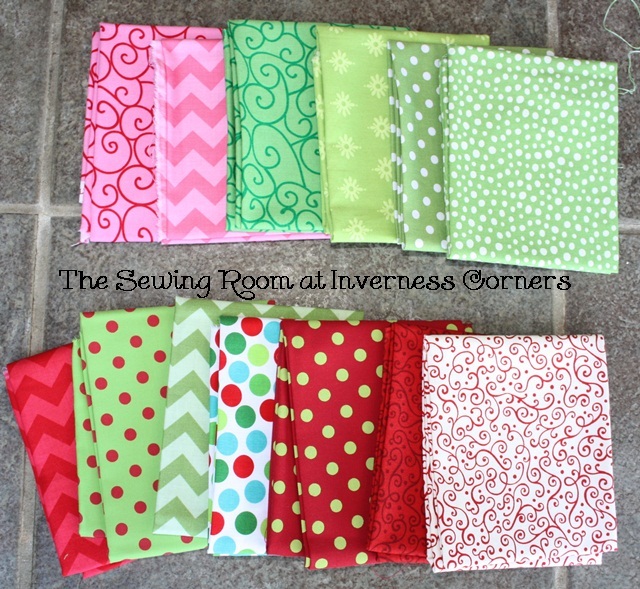 Some great dots, love the aqua swirly fabric (I’m thinking snowman patch) and more Chevron! 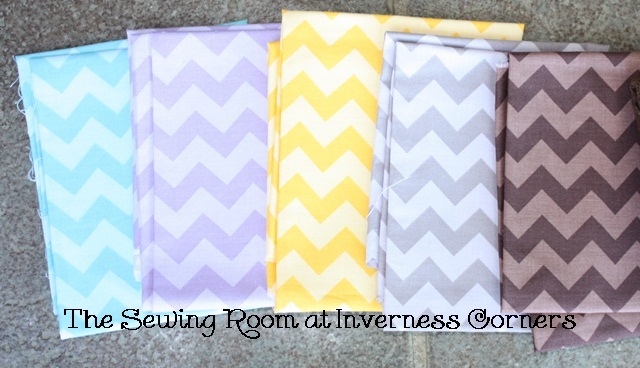 Tone on tone Chevrons from Riley Blake. They also have this great leather. I have not used it yet but it would be great for football designs! Here are a couple of shirts I did yesterday. Another toolbox! This will go with some red cord and blue gingham pants. 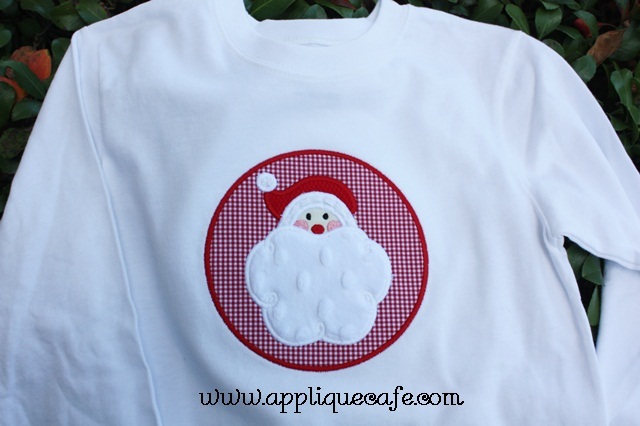 What do you do if you want to put Santa on a white shirt? Put him on a PATCH! This is our circle patch. Actually, most anything looks cute on a patch! This is our Santa design. 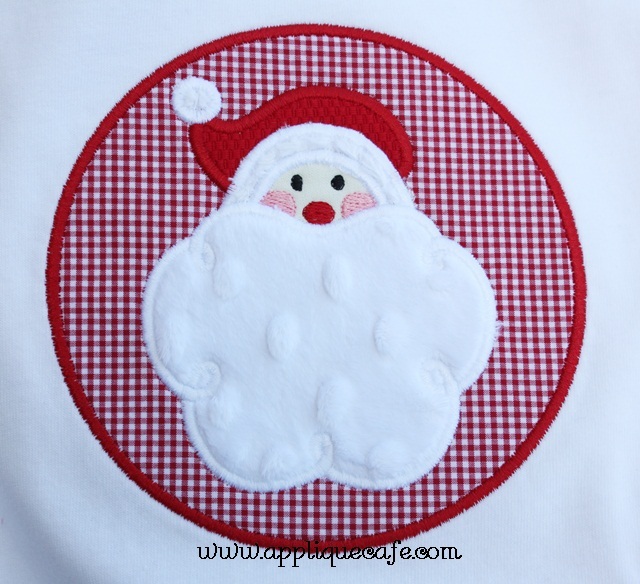 I used white chenille for the hat trim and white minky dot on the beard. 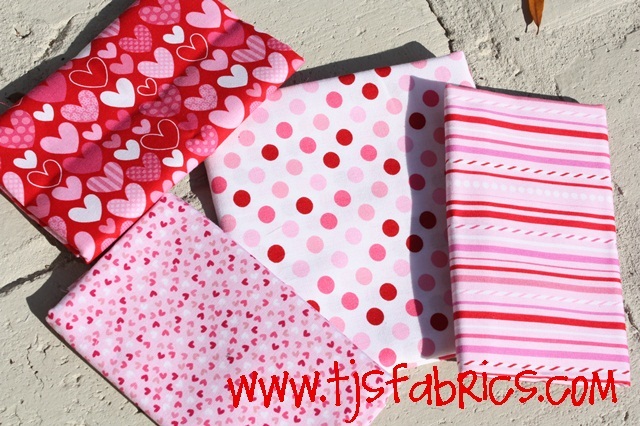 I get asked a lot if I use Heat N Bond Lite on minky fabric. The answer is: Yes I do! I iron it on lightly, peel the paper away and place it down for the design. When I got done with this shirt yesterday, I ironed over the gingham and head of Santa on this design and then ironed it inside out to “fuse” the beard. As you can see no dots disappeared. 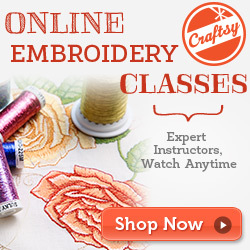 Back to sampling some new Applique Cafe designs. 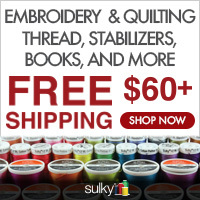 Remember our Fall Sale is going on through Thursday, November 1st. 40% off Halloween & Thanksgiving designs and 25% off everything else.